Alongside the Huawei P30 and Huawei P30 Pro Huawei's also today launched the Freelace wireless headphones. They can give you 4 hours of music from 5 minutes of charging, with initial pairing and charging via a curious, pull-off USB-C arrangement. This at least removes the need for a separate USB cable but I'm not too sure it's the greatest idea ever, since it involves pulling off one of your buds. Nobody wants to be pulling off one of their buds. It also seems like an odd idea to trigger wireless pairing by… plugging in a wire. Seriously, connecting to Bluetooth buds is not hard. Anyway, this feature only works with Huawei's own phones, running the latest EMUI 91 OS. FreeLace is made of memory metal – as used in some spectacles – wrapped in liquid silicon. Huawei says this offers 'a decorative appearance' – have a look at the photo and make your own minds up on that one – and a feel that is 'soft and skin-friendly'. Huawei Freelace also 'pair' more normally via Bluetooth for non-EMUI users, and come in 4 colours – Graphite Black, Amber Sunrise, Emerald Green and Moonlight Silver – to complement the P30. Total battery life is 18 hours of music or 12 hours of calls. Huawei Freelace will set you back €99 – about £90 – when they launch on April 11. No testing has been allowed so far so we have no idea what they will sound like, but let's assume, 'bassy and fun'. Huawei adds that the Freelace can be sent into standby mode by taking them off and clipping them together (there are magnets in the tips). This never works very well, in my experience so far. The in-line control buttons handle play, skip, pause and, with a longer press, activating Google Assistant. 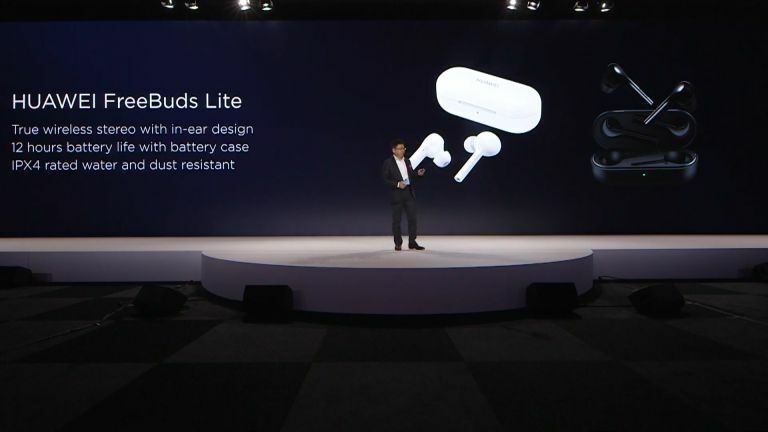 Huawei also revealed a more direct AirPods 2 rival in the shape of FreeBuds Lite. These true wireless buds offer 12 hours of battery life – it's not clear if that means 12 hours without charging, or 12 hours with recharges in their battery case. The former sounds unlikely, the latter short even by true wireless standards. They're IPX4 rated – water resistant rather than waterproof – so probably well suited to use as gym and running headphones. They'll cost €119 – about £100. Huawei FreeBuds already exist, look the same, and are priced pretty much the same as these new FreeBuds Lite. So to be honest, I am not sure what Huawei has even released, here. Huawei helpfully tweeted about the Freelace earlier today.